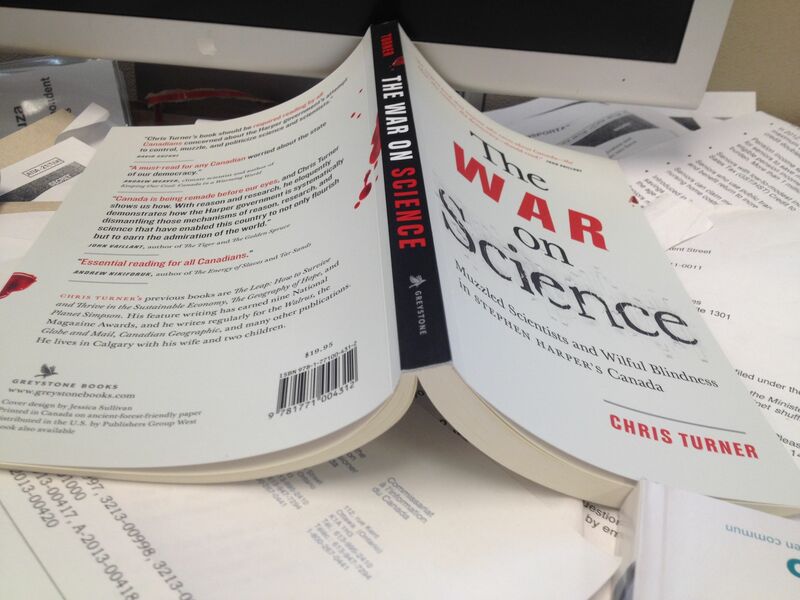 Calgary author Chris Turner has written a book based on evidence that the federal government is allegedly muzzling its scientists. Ten days ago, I asked Environment Canada whether any of its scientists would be available for interviews about their research. The department hasn’t yet answered this question along with others. The questions arose following the publication of a new study concluding that deposits of toxic mercury were forming a bull’s eye around oilsands operations in Alberta. The scientists who did the research from Environment Canada were previously discouraged from talking about their work at a science conference in 2011, according to documents released through access to information legislation. Those documents included a script that suggested they downplay human health impacts of polycyclic aromatic hydrocarbons, a toxin that can originate from smokestacks in oilsands facilities or other industrial development, by comparing it to food fit for consumption. “If pressed on human health (say that) these (oilsands) substances are also found in BBQ’ed steak,” said the script, which was shared with the offices of former natural resources minister Joe Oliver – now the finance minister – and former environment minister Peter Kent, who is still sitting as a Conservative MP. While the department appears to be struggling to answer basic questions about this script and other science-related questions, its minister, Leona Aglukkaq, has declined to answer some questions about her own opinions and approach. As part of this recently published story in InsideClimate News about Quebec and California’s innovative cap and trade system to tackle industrial greenhouse gases and fight climate change, we asked the minister’s office if it could share her opinion about these cross-border efforts to make polluters pay. But her spokeswoman declined to comment and forwarded questions (about the minister’s opinions) to non-partisan public servants at Environment Canada. The federal department has recently released a new “science guide” with five key principles designed to help it fulfill its mandate: Relevance, transparency, responsiveness, excellence and collaboration. But it’s not clear what the department means by “transparency” or “responsiveness” along with the other guiding principles. Aglukkaq was recently pressed in the House of Commons by NDP MPs François Choquette and Kennedy Stewart to address allegations that Prime Minister Stephen Harper’s government is censoring information about scientific research. Stewart alleged that Aglukkaq was “forcing staff her staff to parrot” the grilled steak comparison. Aglukkaq responded by suggesting that the Harper government was showing transparency by allowing the scientific research to be published. 1) Will any of the scientists from Environment Canada be available for interviews about their research in the future? No response. 2) When will these scientists be allowed to give interviews? No response. 3) If none of these scientists will be allowed to speak publicly about their research, would you be able to provide an explanation? No response. 4) What efforts has Environment Canada taken to measure levels of mercury, VOCs, PAHs or other pollutants coming from oilsands facilities at their source? No response. 5) How does Environment Canada know that pollution levels reported by oilsands companies in their inventory reports are accurate? No response. 6) Does Environment Canada believe the concentrations of PAHs in barbecued steaks are comparable to the concentrations of PAHs produced as a result of industrial development in the oilsands? No response. 7) Can you provide some background scientific details about how a comparison with barbecued steak realistically represents the nature of harmful substances found in waters or ecosystems near oilsands production? No response. 1) How many times has the minister met in boardrooms of oil and gas companies or with CAPP since she was named minister? 2) How does she approach these meetings and how does she prepare for them? 3) Has she ever personally felt intimidated by having to deal directly with executives from the oil and gas industry? 4) Does she approach the meetings in the same way she approaches meetings with other stakeholders? 5) What differences has she observed in the approach of oil and gas industry stakeholders versus the approach of other stakeholders? Minister Aglukkaq meets with a range of stakeholders relevant to her portfolios to hear their views and perspectives. The interests of Canadians are Minister Aglukkaq’s top priority in all of her meetings. 1) What does making the interests of Canadians a top priority mean to the minister? 2) How does she do this or what evidence or examples can she give to demonstrate how she has done this? The department will be responding to you on this issue. The Government of Canada is committed to protecting the environment while keeping the Canadian economy strong. The Government has created three national wildlife areas, three marine protected areas, two national parks, two national marine conservation areas, and one national historic site since 2006 – for a total an area nearly twice the size of Vancouver Island. More than 90 000 hectares of wildlife habitat have also been protected and, thanks to federal investments, the Nature Conservancy of Canada has secured an additional 369 000 hectares. Moving forward, and as announced in the 2013 Speech from the Throne, the Canadian Government will unveil a new National Conservation Plan to further increase protected areas, focusing on stronger marine and coastal conservation. The Plan, which will be announced in 2014, will build upon conservation-related measures in Budget 2014, including encouraging donations under the Ecological Gifts Program, investing in national parks, conserving recreational fisheries, and supporting family-oriented conservation activities. Considerable efforts are also dedicated to the conservation and protection of species at risk. An important milestone was the December 2013 publication of an Emergency Protection Order for the Greater Sage-Grouse under the Species at Risk Act, which came into force on February 18, 2014. This marked the first time that the federal government has issued such an order to protect a species facing imminent threats to its survival. The Government of Canada believes that economic prosperity and environmental protection are not mutually exclusive goals. Through its Responsible Resource Development approach, Canada achieves the right balance to unleash the potential of its resource sectors to create high-value jobs while strengthening safety and environmental protection. The Canadian Environmental Assessment Act, 2012 (CEAA 2012) is an important part of this approach. CEAA 2012 established legal timelines for environmental assessments and reduced duplication with provincial reviews. However, faster reviews do not mean substandard reviews. The government continues to have a rigorous environmental review process. Environment Canada provides Canadians with high quality weather services and is currently working to strengthen its activities. This includes new investments in federal infrastructure such as radars, and surface weather and climate monitoring stations. Canadians will benefit from more timely, accurate weather warnings and forecasts in all parts of the country as a result of these important investments. The Government has a strong, comprehensive approach to safeguard this country’s water resources. Canada’s collaboration with the United States led to an enhanced and renewed Great Lakes Water Quality Agreement. The Government is investing in the Great Lakes Nutrient Initiative to address the re-emergence of algae caused by excessive phosphorous discharges, in the clean-up of Hamilton Harbour, and in the restoration of the ecological health of the Lake Simcoe area. The second phase of the Lake Winnipeg Basin Initiative has commenced and the St. Lawrence Action Plan has been renewed. Environment Canada’s enforcement initiatives continue to help provide Canadians with a clean, safe and sustainable environment. In 2013 our enforcement team worked on a number of major prosecutions, including a $500,000 fine for the illegal use of pesticide in the waters of southwestern New Brunswick. This was one of the largest fines ever administered under the Fisheries Act. With respect to greenhouse gases, the Government of Canada has taken action on two of the largest sources of emissions in this country-the transportation and electricity sectors. Canada was the first country to phase out traditional coal-fired electricity generation units. Thanks to our actions, this country’s 2020 greenhouse gas emissions are projected to be 128 megatonnes lower relative to where emissions had originally been projected to be in 2020 without action. Internationally, Canada is actively participating in negotiations towards a single, new international climate change agreement that includes meaningful commitments by all major emitters. Canada has fully delivered on its fast-start financing commitment by providing $1.2 billion over 2010-2013, our largest ever contribution to international climate change finance. This funding is now supporting a range of climate change projects in over 60 developing countries. In addition, Canada is proud to be a lead partner in the Climate and Clean Air Coalition (CCAC) to reduce short-lived climate pollutants, which are potent global warmers and dangerous air pollutants. While we are unable to arrange for an interview, I can provide you with a response on this issue. To date, the results of environmental monitoring in the oil sands region show that low levels of oil sands development-related substances are present in both air and water. Mercury levels found in the oil sands region snowpack near the development are above the background levels but below guidelines. Levels decrease with increasing distance from oil sands development. Mercury levels are low compared with many industrial developments, and are only slightly higher than those found in relatively undeveloped areas such as northwestern Ontario. Considering methylmercury is a neurotoxin that bioaccumulates in the food web, it is important to continue tracking mercury levels in the oil sands development area to ensure they remain below acceptable levels. Atmospheric deposition of mercury and methylmercury is elevated near major oil sands developments (i.e. loads reach over 1,000 and 19 ng/m2 for total mercury and methylmercury, respectively, at several sites in the vicinity of the oil sands development). Maximum mercury loads in the oil sands region are low compared to those observed in contaminated region of the Northern hemisphere that are directly influenced by anthropogenic sources. What is somewhat unique about our findings is that although mercury deposition is often elevated in industrial areas, methylmercury (the toxic form that bioaccumulates through food webs) is not often measured and is generally not thought to be deposited in atmospheric deposition in large quantities. The raw data that went into generating the deposition maps will be made available on the Canada-Alberta Oil Sands Environmental Monitoring Information Portal in the coming months. Concentrations of mercury in melted snow are under water quality guidelines for the Protection of Aquatic Life established by the Canadian Council of Ministers of the Environment (CCME). This entry was posted in Air pollution, muzzling, oil and gas, public relations, Science and tagged Chris Turner, Environment Canada, François Choquette, InsideClimate News, Joe Oliver, Kennedy Stewart, Leona Aglukkaq, mercury, muzzling, New Democratic Party of Canada, oilsands, PAHs, Peter Kent, poly aromatic hydrocarbons, science, scientists, Stephen Harper, toxins by Mike De Souza. Bookmark the permalink.